Several people asked about the C-stand (short for century stand) that I used on the Rosco OA posted on Monday. Long story short, after spending 2 months on the road with McNally and crew last year, I have become a convert. If you have never used a C-stand, and/or are considering getting one, here's what you need to know. First off, I am still a big fan of normal light stands. I have … a few. But when you need support that is more flexible — and heavier duty — C-stands fit the bill. If you are used to traditional folding light stands, C-stands can look big, cumbersome and a little unwieldy. That's because they are big, cumbersome and a little unwieldy. But they are worth their weight in gold when it comes to multi-purpose usefulness. The base consists of three legs. You want to get the kind that are detachable, as this helps greatly with transport options. 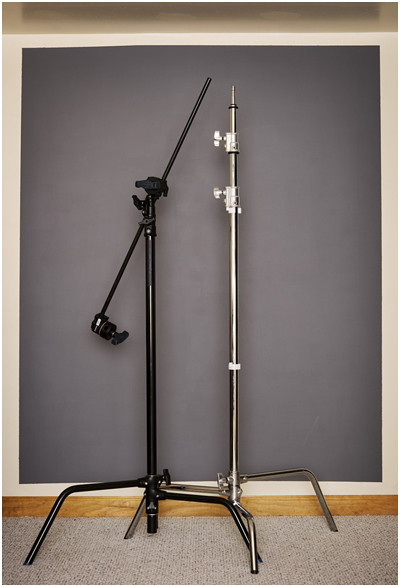 C-stands are heavy, and this leg style further concentrates that weight at the base when compared to a traditional light stand. Which gives them a very low center of gravity, too. And unlike a standard light stand, the legs flow out horizontally. This makes a C-stand ideally suited for sandbags. You can bag the crap out of a C-stand sufficient to make it stable under just about any circumstances. Normal light stands do not marry to sandbags nearly as well. The riser is available in different lengths. I strongly suggest the 40" 3-section riser. It will get you to over ten feet high, not counting the extension arm. As for the extension arm, go for the 40" (way more useful than a 20") with a single grip head. The grip head is what attaches the extension arm to the riser. But it can also do all kinds of cool things at the other end of the arm. If you find you need a second grip head (I have yet to do so) you can always grab it later. They pack … poorly. I drive an itty bitty Scion XA, the natural enemy of the C-stand. But it still works. I put them in last, on top of other gear, to see if my gear pack will allow me to transport the C-stands already assembled. If I am tight for space, I strip them down to parts for a much more efficient fit. McNally flies with them, which means he is single-handedly keeping Delta profitable with his baggage fees. I do not recommend this. C-stands are happiest riding around in car trunks. So, they are big and heavy. But all that weight and bulk makes them oh-so-useful. With a 40" 3-section riser and a 40" boom, you can put a strobe over 13 feet off of the ground — securely, if bagged. Or one inch off of the ground. Or anywhere in between. The extension arm gives you lateral support like a boom. So you can float a light out over/in front of someone and shoot under it unobstructed. Ditto for a second light above/behind them for separation with an unobstructed background sweep. Or a clamshell setup in front. Two C-stands with arms can slide right into both ends of any roll of background paper (up to and including full-width) for an instant background support. The leverage these things can handle is insane. I originally got a mix of Avenger and LumoPro C-stands. Three complete (with extension arms) sets, total. And in three ways, I now realize I overbought. First, two C-stands with 40" extension arms would have sufficed for every time I have used them. (Which is a lot.) They tend to be most useful in pairs as described above. But even a single C-stand/extension arm can get you out of a lot of problems, too. Second, I got the two-grip head extension arms. So far, just the single grip had that secures the arm to the stand would have sufficed for me. Third, having used the Avenger and LumoPro C-stands, I should have skipped the built-in distribution costs on the Avenger and gone with the less expensive LP version. ($135 total for the combo of the tall riser/legs and the 40" single-grip arm.) They are just as solid as the Avenger (if not more so) with a 5-yr warranty as compared to 2 years for Avenger. That said, it is highly unlikely that you could destroy a C-stand even if you tried. They are ridiculously, wonderfully overbuilt. It's a buy-once-for-life kind of thing. They'll last forever. You'll either pass them on to your grandkids, or your spouse will sell them on eBay after you die.